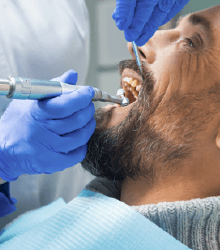 In order to improve the quality and comfort of all of our dental treatment options, we have invested in the latest dentistry techniques and technologies. When we bring a new technology into the office, we’re looking for tools we can use to improve our patients’ experiences in our office. Dental implant supported tooth replacement is one of the most complex treatments we offer, and in order to ensure comfort, safety, and success, we utilize a fully streamlined digital dentistry process that incorporates a number of the most advanced dental technologies we utilize in our office. If you want to find out more or schedule a tooth replacement consultation appointment, call our Brampton dental office. 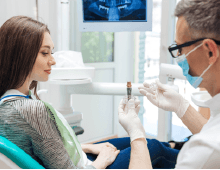 During your dental implant appointment, we’ll work with you to understand the entire dental implant process and the technologies we’ll use at Torbram Dental to improve your personalized tooth replacement plan. Integration of diagnosis, planning, and treatment is what makes it possible for us to perform even the most advanced procedures. 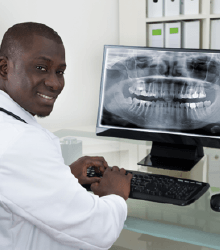 In order to streamline even complex treatment plans, we use state-of-the-art digital x-rays, images, 3D scans, and surgical guides. From diagnosis to the placement of your final tooth replacement prosthetic, our digital dentistry system allows us to effectively plan and complete dentistry services. 3D CT scans are used to capture precise images of your full bite. This ensures your replacement tooth or teeth will interact flawlessly together, delivering a smile that looks, feels, and functions just like your healthy, natural bite. Traditional images just show us a two dimensional representation of one part of the smile. 3D CT scans give a 360 degree view of individual teeth, sections of the bite, or the full smile. 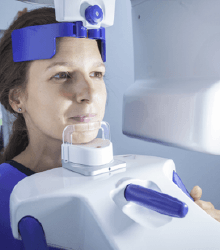 We can even capture scans of the jaw and other oral and facial structures. Some of the most essential technologies we utilize as part of the dental implant tooth replacement process are 3D surgical guides. These treatment planning tools allow us to precisely position your dental implant posts to give you the highest chances for successful implantation. Our surgical guides allow us to easily avoid nerve structures and utilize the densest areas of bone to provide support for your implant restorations. Guided surgery ensures patients receive the fastest, most predictable surgical dental implant placement procedures possible.